What is a good in-game team for Black/White 2? @nko89 you can teach it through TM. Honestly you don’t need a fire type to beat the game. Focus on countering the types for elite 4 and champion. Heat Crash is great for Emboar. Since he weighs at 330.7 lbs. or 150 kg, he can destroy grass, bug and ice types really quick. This guy needs curse for gyro ball, he only has 20 speed. The tail allows the learning of both Aqua and Iron tail, Dragon Pulse is coverage. Now this Pokémon is the Special attack version of Floatzel. Weavile has really Low special Attack. You should replace dark pulse, shadow ball, and ice beam to moves like ice punch and night slash. 1) Arcanine does have better stat total, such as Attack and Special Attack, and Defense is better slightly. 3) If you include Egg, HM, TM, Pre-Evolution, Regular, and Move Tutor, Arcanine has access to one extra move. 4) Main Mandatory trainers (Gym, Elite, Champion) have 95 physical moves total, 49 special, and 26 status, and since Arcanine has a stronger defense (if you trade both at the beginning) it helps last longer (ignoring EVs, IVs, and Natures). 5) Growlithe is found in Virbank, allowing a good time to make it close to the Gym level, where as you require Waterfall to get Vulpix/Ninetales, but they will be around level 34, where Victory Road (when you get it) is around 50. A Snivy based team, made for Black 2 with movesets specified for the elite four. Leech Seed is to stall your opponent out and get free HP. Giga Drain is special STAB and also gives free HP. Leaf Blade is powerful Physical STAB and Dragon Pulse is special coverage and great against the champion. Waterfall is Physical STAB, Ice Punch is good Grass and Dragon coverage and Superpower is powerful coverage as well. Rain Dance is nice to set up and powers up Water moves. While this moveset is very difficult to get, it is so worth it in the end and you end up with one of the best Fire-types in the game. Flamethrower is powerful special STAB. Outrage and Crunch are both great coverage and Extremespeed is very powerful +2 priority. Thunderbolt and Flash Cannon are powerful STAB. Reflect raises defense and Thunder Wave is a helpful move that really cripples the opponents. Fly is physical STAB. Shadow Ball is coverage and for Psychic-types. Toxic can stall out the opponent and Confuse Ray makes him hit way less. Psychic is STAB, Shadow Ball and Signal Beam both cover a weakness each. Light Screen raises Special defense for the entire team. Another great thing about this team is that all Pokemon are catchable before the 3rd gym, so you have a complete team by then. I’m not saying your team is bad or anything, but 6 Pokémon before the third team is way too much. Unless you grind a lot, you’d get really underlevled. The Oshawott Line has to be one of my favourite evolution lines in the series, all three Pokémon are great: Oshawott is adorable and both Dewott and Samurott are awesome. They also have great stats, a great movepool and good matchups throughout the game, making it most likely the best starter in Unova. Surf is STAB and can get you across bodies of water, Waterfall is another STAB and gets you up and down waterfalls (having both a Physical and Special STAB also allows Samurott to be a good mixed attacker as having both will allow him to hit different things harder. For example, Surf is going to hit Aggron much harder than a Waterfall would), Ice Beam covers his Grass weakness, as does Megahorn/X-Scissor (X-Scissor is for if you dislike the 85% accuracy on Megahorn), but having them both allows Samurott to cover even more types, even if he’s not weak to them (You could also swap out Megahorn/X-Scissor for Dig to cover his Electric weakness, but it takes two turns to use and doesn’t hit incredibly hard). While Poison may not be a good offensive typing (pre-Fairy), it has to be one of the best defensive types in the game, and Weezing really fits that. Weezing has great Defense, good moves and a great ability (Levitate gives it only one weakness) that adds on to his bulky nature, and that makes for probably one of the best Physical tanks in the game. Sludge Bomb is STAB, Will-O-Wisp burns the foe, halving their attack adding to the defensive nature, Shadow Ball covers his only weakness: Psychic, and Explosion is if you want to really dent something if you don’t mind sacrificing Weezing. You can play around a bit with Weezing's moveset if you want: you can use the Toxic to Venoshock combo, you can give him Destiny Bond, Flamethrower, Gyro Ball, Fire Blast and even more if you want. Krookodile is one of those Pokémon who has been blessed with two amazing abilities that can basically decide how he plays. Intimidate makes him a very good switch-in and Moxie makes him an excellent Physical Sweeper. Krookodile also has great stats and a great dual-typing giving him constant usage throughout the game. Earthquake and Crunch are STAB and between Rock Slide and Aerial Ace you cover almost all of Krookodile’s weaknesses (all except Water). You can also experiment a lot with Krookodile as he a huge amount coverage moves such as Dragon Tail, Shadow Claw, Stone Edge, Low Sweep, Brick Break and more. While Ferrothorn is very popular in competitive battling, I think he’s very underrated when it comes to in-game teams. He is another extremely good tank with both amazing Defense and Special Defense, as well as having solid attack so he can deal damage. Also, just take in the Iron Barbs + Rocky Helmet deal ¼ of the foes HP if they use a contact move on Ferrothorn, making him an amazing switch in on Physical attackers. Power Whip is STAB (Seed Bomb is another option if you dislike the accuracy, but you need to get Seed Bomb from a tutor, and 85% accuracy is still pretty good), Iron Head/Gyro Ball is STAB, Iron Defense/Curse is for setting up (if you’re running Gyro Ball, definitely choose Curse, but if running Iron Head, you can use either) and Toxic is for even more chip damage and works well with Ferrothorn’s bulk. You could also run Ingrain, but I decided not to as it prevents Ferrothorn from switching out. 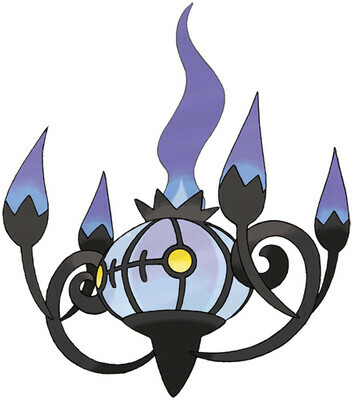 Chandelure has the highest Special Attack of any non-legendary (at least when this game was out), so no doubt that it is very powerful. It also has solid enough Speed and Defences to not have to rely on set ups, and its great Special movepool makes it even better at destroying everything. Shadow Ball and Flamethrower are STAB (Chandelure has many other options for strong Fire attacks, such as Inferno, Fire Blast, Overheat and Heat Wave, but I went with Flamethrower since it is the most consistent), Energy Ball covers her weaknesses to Ground, Water and Rock, and Psychic is just for more type coverage, but you could swap this around for other things like Sunny Day to burn the world to a crisp, or some of those other Fire attacks, or Confuse Ray for status, Fire Spin for chip damage, and the list goes on. Mienshao is easily one of the best Fighting types in the game, despite how late it evolves. It has amazing Attack, Special Attack and Speed, a fantastic Physical movepool and an amazing ability in Regenerator. Mienshao also happens to be my second favourite Fighting type ever behind Gallade. Drain Punch is STAB and heals Mienshao, U-Turn covers Mienshao’s weakness to Psychic and also gives an automatic swap (You can use U-Turn in combination with Regenerator to do damage and heal at the same time), High Jump Kick is another STAB and deals huge damage, and its drawback of hurting the user if it misses it almost negated by Wide Lens (buffs up accuracy to 99%), and Rock Slide covers her weakness to Flying. You can also experiment with a lot of different moves like: Acrobatics, Stone Edge, Fake Out, Dig etc. Errr... Lazy... xP. I'll put all easly. He will be your starter. Flare Blitz is strong, but takes recoil. Heat Crash is a option if you don't like recoils. Hammer Arm is strong, but lowers the user speed. I think this will not cause much difference cause he has low speed at the start. Focus Blast if you want a little more power, but have low accuracy or Brick Break to crash the walls. I'll go with Hammer Arm. Wild Charge is to cover Water- and Flying-types weakness. Thunder Punch is a option if you don't like recoils. Assurance is to get some Psychic-types. Scald is to K.O. the Ground-types. Icicle Crash gains STAB. Brick Break takes some Rock- and Steel-types. Strength is HM. Dive is HM plus can take some Rock- and Fire-types. Foul Play and Night Daze gains STAB. Aerial Ace is for Bug- and Fighting-types. U-turn is to deal a bit of damage before changing the Pokemon. Is good put Braviary/Mandibuzz in the last slot to make a Illusion because she/he is a Flying-type so Bug- and Fighting-type maybe not very effective. Surf and Waterfall gains STAB and is HM. Ice Beam is for Grass-types. Psychic/Psyshock/Zen Headbutt is for hitting the Water-types. He is avaliable in Pokemon White 2. You can catch a Braviary(not Rufflet) in Route 4(Mondays only) with Defiant as ability. Fly gains STAB and is HM. Return/Slash/Crush Claw gains STAB. Superpower is to take some Rock- and Ice-types. Sky Attack is the best Flying-type move in my opinion. She is avaliable in Pokemon Black 2. You can catch a Mandibuz(not a Vullaby) in Route 4(Thurdays only) with Weak Armor as ability. Fly gains STAB and is HM. Foul Play gains STAB. Bone Rush is to take some Rock- and Electric-types. Heat Wave is to kill some Ice-types. She is avaliable only in Pokemon White 2 but you can get it trading a Cottonee for Petilil in Black 2. Cut is HM. Quiver Dance boosts the speed and the deadly sp.atk. Petal Dance + Own Tempo = Destruction fatalic. Hidden Power: Rock to take Fire, Ice, Flying and Bug. If can't you may try to have Ground/Fire/Fighting-type Hidden Power to take out some Steel-types. If you can't get any of this Hidden Powers you may use Leech Seed. @UltimateFlygon: If you want to talk about me behind my back, please be polite enough to do it somewhere I can't see it. That's plain rude. You should judge someone when you know them, not when they post advice on an ingame team for B/W2. This team is still a bit... meh. You'd have like 5 Pokemon before Gym 4, which can be very problematic. And Emolga isn't very good. I don't want you to put in an electric/grass type, just a suggestion. hey ppl... may I use vaporeon as a slave and put a Gigalith in the place of the Beartic? The moveset will be: Stone Edge, Earthquake, Hidden Power(Grass/Fly/Ice) or Solar Beam if I can't get any of this 3, Curse. You don't need our permission. This is for you fire type starter fans who picked Tepig in Black 2. This will be your fire type starter for the game.The Rah nature is for upping the special attack stat by ten,and there's no chance that emboar can get great special defence. I choose flamethrower over fire blast or overheat beacause I prefer high usage and Fire Blast does'nt nessesarily have the best accuracy,and I choose a fire type move beacause I don't think there will be any others on this team and STAB.Hammer Arm gives STAB and I like it beacause of it's suprisingly strong power.ThunderPunch covers the water,and flying weaknesses.Scald covers the ground weakness and can give a nice burn once and a while to your opponent. 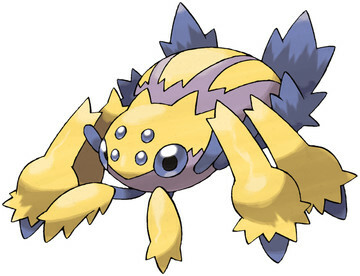 This crustle will be your rock type and your main defensive Pokemon on your team.X-Scisor has STAB,and this will be strong.I'll take it over U-Turn beacause u-turn makes you switch out and you only need that when you encounter a wayer type,beacause water types is crustle's only weakness.Earthquake is just for the type coverage plus I need a ground type move somewhere in here,right?Stealth Rock is my only hazard,plus it'll be early in the battle beacause it's my second Pokemon. Rock Slide is once again,STAB.i like it better than Stone Edge beacause of it's low PP. This is your electric type.I also choose it beacause of it's secondary steel type.Anyways, Thunderbolt is STAB and I choose it over thunder beacause I wanted a lot of PP usage and this had the best when it comes to that and power.Flash Cannon is STAB, and now I have the final type move of the three main strong types(Steel,Ground,and Rock).Thunder Wave can really help when your catching legendaries and being a nusince to your opponent.I couldn't find anything for the last slot so I did explosion beacause of when your about to faint. I needed a flyer for my team and I needed a surfer,so I took Swanna.It's got the sea insence to boost surf so it'll have great power and high PP.Everyone needs a Pokemon that knows fly!Unless you really like walking in the game or your trying to catch an egg.Plus this gives STAB to Swanna. Surf is also STAB and you need to surf to win the game,so this is how your going to "Walk on water".Ice Beam I needed there beacause of those bulky special Dragons that you can't beat with anything.Finally,Roost I use when I'm about to die,and when your friend is about to knock out your last Pokemon,Swanna,and then it uses Roost. This guy is mostly for the E4, or the dark,psychic,fighting,and ghost types.I like to think of this guy as your last hope.The Adamant nature is to boost attack to 99.I also choose this one beacause this scrafty has no special moves so there's no use in the special attack stat.Payback is STAB,is given another boost beacause somebody probably already fainted in your team, and covers ghost types like golurk and covers psychic types like gothitelle. Focus Punch is very strong and it's a guranted hit if it has it's substitute out.Plus this move gives STAB to Scrafty. Zen Headbutt was the only psychic or flying type move Scrafty could learn so I can cover Fighting types in the E4 like Minshao, this is good beacause fighting types is Scrafty's only weaknesses in the E4.Substitute can really help making Scrafty last when it's your last Pokemon and it can help guranteing that focus punch hits your opponent. I needed to get a grass type in here somewhere and I finally came up with this one.Petal Dance is STAB and has(for some reason)10 PP for a 120 power move.Now that's a deal!Spikes is my second hazard on my team. I thought of putting something else here but there wasn't anything else that was that great and I didn't need toxic spikes beacause of Roserade's poison point. Giga Drain is STAB. 'Nuff said. Sludge Bomb is STAB,and can cover the grass types that just get in the way. Well,this is my suggestion for a good ingame team for Emboar lovers.zi hope this will beacome a great team! I had nothing else to put there,so why not! Because Roserade has an abysmal 70 attack. And why not Giga Drain? unfezant.Strength obviously for pushing rocks in game. signal beam for coverage against those grass types. those ground types and crunch for more coverage. Good team but i`ll replace Walrein with Golduck and Hereacross with Zoroark or Drapion. Plus Metagross is a beast. why putting strenght on heracross? Why both surf and watterfall in the pokemon used to fight instead of the HM especialist? You have to split the pokemons you will use to fight and the ones you will use to do another tasks like HM especialist. I just swap Lucky Eggs and Amulet Coins among my Pokemon, so I'm not going to list the items. Before you get the pre-evos of the Pokemon I'm listing, carry around an army of Pickup Lillipups to get you items. Also have a Pokemon that can use Surf before you get Jellicent. The moves are pre-Elite 4, so TMs such as Earthquake are not there. The best of the starters is the worst of the starters. Like any paradox, once you think about that statement, you realize it's truth. Emboar is outclassed completely by the powerful Darmanitan. And having Emboar means you can't have two of the best Pokemon in the game, Volcarona and Lucario, without doubling up on your types, which is something I never enjoy doing for ingame. Because of these facts, Emboar is the worst of the starters. Now, this Emboar can still do some damage. No Speed EVs, as eventually you'll get to the point where the base speed of your opponent outspeeds Emboar's full speed. So the focus is on HP and Attack, with an Adamant nature. Fire Punch you can get from the tutor and is Emboar's most reliable attack. You can use Flare Blitz however if you either don't mind the recoil or have a large supply of healing items. Low Kick becomes useful later on, getting STAB and doing solid damage to heavy foes you face. Bulldoze and Thunderpunch provide coverage, with Bulldoze even slowing down the foe so Emboar can outspeed slower opponents. Your Flying type. You get it pretty early on, in Castelia Sewers. You can easily evolve it into a Golbat, and probably a Crobat after your next level up. Crobat's main job is to Fly you around. With good stats, this is the best Pokemon to do that for Emboar. Cross Poison is STAB. X-Scissor hits Psychic types hard. Wing Attack is a STAB move you can use when you don't want to use Fly, which I find is often. It also has a whopping 35 PP, so you can go quite some time without a Pokemon Center or Doctor before needing to replenish Crobat's PP. With 31 Speed IVs you hit 327 Speed, enough to outrun any Accelegor. It's a good number to aim for, just so Crobat is faster than everything you face. Then we have Attack and bulk. The choice of your Ground type is a hard one. There are many good Ground types in BW2. In addition to Excadrill you have Krookodile, Mamoswine, and Golurk as the ones of note. I won't blame you for choosing any of those three instead of Excadrill, as they're all great Pokemon. However, I find that Excadrill's Attack and Speed give it an advantage over the others. Plus, you get it earliest. Drillbur can be found in Relic Passage Dust Clouds. It soon proves itself handy vs Elesa. Earthquake just tears apart everything in the game. Iron Head also hits hard. And Rock Slide takes down Flying types. Strength is a useful HM for ingame. The Speed EVs allow you to outspeed Zebstrika among other things. Then we have full out Attack and some bulk. You thought Excadrill and Emboar hit hard. Haxorus makes them look like Metapod using Tackle. Outrage just pulverizes the opponent. And since this is inmgame, you can switch out once you take down the foe, meaning you don't get trapped in Outrage as easily as in competitive. Bulldoze offers coverage, and is nice along with Mold Breaker, especially in getting past that damn Boldore Sturdy. Since you'll mostly just crush everything using Outrage, Dragon Claw is there to provide more PP to your STAB. False Swipe is for use in catching Pokemon. The EVs give you nice Speed, great Attack, and some bulk. Your Water type. There aren't really many good Water type options. Jellicent is the best one in my opinion. It has great typing with multiple resistances and three immunities with help from Water Absorb. While you get it later in the game, a bit before getting to the 7th Gym Leader, you get it at a nice level 40. So it doesn't hold your team back when you get it. The main purpose of it is to use Surf, the best ingame move ever. Shadow Ball is STAB. Ice Beam is coverage. Waterfall is another HM. EVs give bulk and offense. You use this gal for Black 2. You get it around the 4th Gym, which is nice. I prefer Reuniculus, but that isn't an option for some people. Gothitelle is good also. Solid Special Attack and nice bulk. Frisk is cool, showing you what Pokemon to catch because they have items on them. Psychic is STAB. Thunderbolt and Signal Beam are coverage. Thunder Wave helps in catching wild Pokemon. EVs give bulk and power. It is a nice support Pokemon (support as in helping catch and know what to catch) as it has some power behind it. For use with White 2. Easily better than Gothitelle. This thing hits incredibly hard. And it's bulky to boot. Slowest thing on the field, but so worth it. Magic Guard is a great ability also. Psychic is STAB. Shadow and Energy Ball are coverage. Thunder Wave is to help in catching Pokemon. EVs give power and bulk. I really like this team. I'm currently using it in Black 2.
why both wing attack and fly in the same pokemon? Also with cross poison who is effective against the same type as the other two moves? 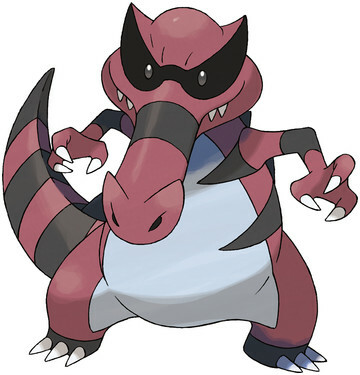 Strenght in the excadrill? You have to split the pokemons you will use to fight and the ones you will use to do another tasks, like HM especialist. I'm not sure if you would use this for competitive purposes, but ingame this works well. Ice Beam to combat any grass types that might appear and is good against Flying and Dragon types as well. Revenge to hit any steel type Pokemon, and if damaged before, the power becomes 120. Close Combat as it has a high base power and with the additional STAB, makes for a pretty good move. Defence does fall but shouldn't be a problem if you keep speed up. Swords Dance as it will further heighten Lucario's already decent attack. Psychic to deal with any poison types as, though they can't hit you, still need to be taken care off. Bone Rush to deal with any Fire type Pokemon, as fire is a weakness to Lucario. Signal Beam - A bug type special move, it can take care of any grass types you encounter, and has a pretty good base power as well. Confuse Ray - Because it's fun watching the enemy hit themselves from time to time, and plus may give you a few free turns to take out your opponent. Power Gem - A rock type move with good base power, good against any fire types and good to mix up some move types. Roost - Mainly to recover health. If you don't want roost, use Return, good base power if your Pokemon love you. U-Turn - Ideal to inflict damage and switch out to a stronger Pokemon if needs be. Flare Blitz as not only is a powerful move, you get a STAB due to it being a fire type move. Highly recommend this move. Energy Ball is a great special move, with a high base power and STAB from it being a grass type. Any Criticism welcome, as I said, I'm not sure about Online battling but this team hasn't failed me yet. I went through many Pokemon in BW2, avoiding the use of legendaries and more frequently used Pokemon, and these six proved themselves worthy. Ive noticed a lot of people used emboar. You know what I call those people? Smart. while stone edge and wild charge provide coverage. Everyone's favorite fetus proved to be one heck of a bulky sweeper. She's (yes it's a female) pretty simple. Calm mind to boost recover when your hurt and break things. With all the sea routes you need a surfer in your main team, and jellicent was mine. She was mainly bulky support but every once in a while she helped offensively. Surf and shadow ball are the stabs with will o wisp adding status and either recover or ice beam rounding out the set with bulk and coverage respectively. The bulky bat scorpion brought an appreciated ground immunity to the team. He and magnezone have good synergy. He serves as a physical bulky attacker as well as a physical hit taker. Sometimes I throw leftovers on him and replace acrobatics with stone edge. Flying and ground get could coverage anyway and toxic is always handy. Roost is for healing (obviously). Well that's what I did, and it made the game a breeze. Hope it helped. Or you can have Arcanine in place of Emboar. It learns Outrage as a Growlithe at level 43 and you can find it in Virbank Complex. It can also learn quite a bit of coverage moves as well, but that's just my opinion though. You need Surf to do most of the game so teach it to your Samurott. You can get Ice Beam in the Giant Chasm and is a strong move. 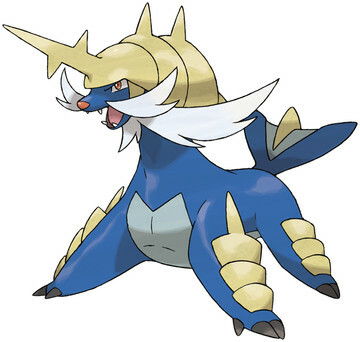 MegaHorn is a powerful move and Razor Shell is a Physical Move Which Samurott needs. Keep Thunder Wave from the start so you can paralysis Pokemon. Thunderbolt and Electro Ball will become a Little more stronger with the Thunder Wave. Power Gem is a good move but you can also take away Power Gem for Signal Beam. You should have Psychic and Swords Dance because it will be helpful to have. Aura Sphere is a really powerful move and so is Earthquake. Shadow Ball and Dark Pulse is redundant. Get rid of Dark Pulse on Chandy. You also have three fighting type moves on Luke. This team was my team, my friends did agreed that it was good. I hope you could try it to and you'll know why I picked these also. Well, I picked this one because it has a good movepool with full of STAB. Here's a summary of why I picked this. Well, Samurott has good STAB moves. Like Hydro Pump. It also has high attack/special attack. As you see, the move "Megahorn" has a good coverage for Grass. Use that move with Bug Gem and you'll be fine with Grass. Now the moves below. Megahorn - A good move for coverage of Grass, this move will be very useful. Surf - STAB. A good move, tied with Waterfall. Waterfall - STAB. Another good move, tied with Surf. Ice Beam - It's good like Megahorn, depending if you have Modest, use this move for coverage for Grass. Well, I have nothing to say but Cofagrigus is a good defense Pokemon. Now the summary. Cofagrigus is a awesome defense Pokemon. Also, it is good at Special Attack, this is useful for Mienshao, from triple or doubles. Well, all I have to say. Now for the moves. Shadow Ball - STAB. A great move. Also great for Cofagrigus due to Special Attack. Energy Ball - This is good, but use this for protection for the team in double/triple battles. Protect - This is pretty good, just useful if your 25% or lesser HP. Psychic - This is also good, like for Energy Ball, protection in double/triple battles. Well, this is my favorite Pokemon for Dark. As you see, this is a good special attacker, like psychic types. But more powerful. Attack moves are useless on this guy. I hear this, "Uhhh, I have Sucker Punch on my Zoroark, it's strong." Yeah, well, it's useless. Now, the summary. I chose this dude because of it's power, y'know. It's very useful due to Dark Pulse and Nasty Plot. Zoroark is also rare. But in BW2, it's common because some guy gives it to you. I forgot the name. Now the moves. Dark Pulse - It's very good, this is a example for "a good move." It's STAB is excellent, it's special, this is a perfect move for Zoroark. Unless you have Adamant. Nasty Plot - A good stat move for Zoroark due to Dark Pulse. Makes Dark Pulse awesome. Flamethrower - This move is also excellent. This protects you from Dark's danger, Bug. Dragonite is awesome. It's nearly close to Zoroark. Like this dude, this one is pro. Good Air moves to. Now to the summary. I chose this due to Fly. It shall be chosen because it's strong. Like I said, these Pokemon were in my team. Dragonite gave me a big help. In the second run of Elite Four, I got damaged , barely any Pokemon were alive. But Dragonite was support. Then when I used Outrage + Dragon Dance, it was positively awesome. Now end of story to moves! Dragon Dance - A awesome move also, Outrage + Dragon Dance is excellent. Fire Punch - Fire Punch is good. Coverage for Ice is excellent. Fly - Important HM. STAB. Mienshao is silimar to a teacher I've met, Ms.Miensho. I don't wanna do a summary now. So. To the moves. Hi Jump Kick - STAB. My favorite moves and is very strong. U-Turn - Coverage for Psychic. A awesome move. Stone Edge - Coverage for Flying. It's also a good move. Drain Punch - Hey, this makes a good emergency healing move. STAB. No summary but all I have to say is, this Pokemon is very strong and good special attack/attack Pokemon. To the moves! ThunderPunch - STAB. Awesome also but some power but strong move. Discharge - I know, to much electric moves but STAB makes it strong. if you lose Levitate this move is good Aqua Tail - It's good when you lost levitate. Now the end. P.S I hope this is useful to you. Give an alteritive Fighting type for Mienshao because it's hard to get Meinshao. Heracross, Lucario are great fighting types. Okay then, I'm doing a oshawott based team this time. Pre elite four only. Let's begin! >Okay, here is samurott your starter. Samurott is a mixed attacker able to use HMs like surf and waterfall. But when your preparing for the elite four I suggest you to use a heart scale to remember aqua jet instead of watefall. So Surf is STAB, Aqua jet is priority, Megahorn for Grimsley and Caitlin and Ice Beam for Iris and grass types. >Next up is Magnezone. You obtain it early on and it's possibly the best electric type in the game. So Thunderbolt and Flash cannon are STAB, Thunder wave to paralyze things and reflect or light screen are great supporting moves and you can switch between them depending on the battle. 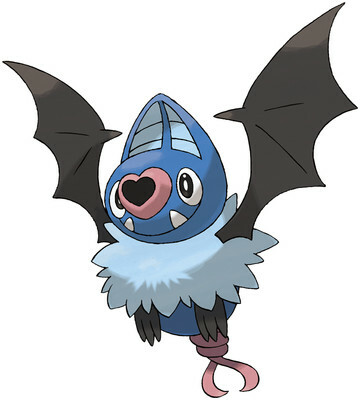 >All right here is crobat this teams flyier. This crobat has two sets one special and one physical. So I made two sets for you to choose because crobats movepool is bigger specially but it has higher physical attack. So the two sets contain of flying STAB and just some other fitting moves. Oh, and I dont need any poison STAB because flying already covers grass types. >Ladies and Gentlemens! Krookodile. This thing is powerful. So, Earthquake and Chrunch are powerful STABs, Rock slide and Brick break are coverage. Not much else to say. He will destroy shauntal and caitlin! >It's chandelure, with it's beastly special attack it is possibly the best ghost type and best fire type in the game. So just as krookodile it has two STAB moves and two coverage moves. >Lastly we have mienshao. This Pokemon has a lot of vaierity which is why he's on this team. So first we have it's risky STAB Hi jump kick and it's more reliable STAB Drain punch, then it has Fake out for some free damage and Acrobatics for coverage. I hope I helped, It is not confirmed that this team is the best but if you look at the stats and moves you will find that these Pokemon are pretty good and obtainable somewhere before the elite 4.
you can not obtain leafeon and musharna before elite four. And why do you have two grass types? Sorry, no huge images in team/moveset answers. You can use sprites if you like. Also, please edit your answer so it's not all uppercase, thanks. I know this is an unusual Pokemon to pick, but its not weak. Mine KO'd Black Kyurem with Rock Blast. It has good type coverage, and you can get one with an ability Skill Link in a Hidden Grotto. STAB Tail Slap, Wake-Up Slap Steel, Rock, Ground, and Dark types, Sing is for Wake-Up Slap, Rock Blast for Flying and Electric types. Overall good type coverage. Good Sweeper, fast, but not that fast. Sandstorm is to activate the ability. Drill Run and Earthquake is STAB. Stone edge is for coverage. It has good attack and average speed, so it is a deadly sweeper. Good Wall and Crippler. Discharge is STAB, Flash Cannon too, Protect is for coverage, and Thunder wave is for a Status Effect. Magnezone is a good Wall, and Staller. It has good Defenses, plus Sturdy ability means that it can't be knocked out with one hit. Overall good addition for your team. Swords Dance is for raising your attack and compliments ExtremeSpeed and making a deadly Close Combat. Close Combat is for STAB, Extremespeed is deadly with a maxed out Attack. Iron Tail is STAB and deadly with Swords Dance. Lilligant is simply the best. With Petal Dance and its ability Own Tempo, it rules the field. Miracle Seed Boosts the power of its attacks, and its health sucking attacks will leave you with a chance to regenerate any time. Petal Dance and Giga Drain is STAB, and Leech Seed is for health. Synthesis is for recovery too. A Pseudo-Legendary Pokemon, this is one of the best Pokemon out there. It has all rounded Attack and Sp. Atk, and a great movepool, its a deadly addition to your team. Rock Slide is coverage, Draco Meteor/Dragon Pulse is STAB, Dark Pulse is STAB too, and Work up is to prepare/recharge after Draco Meteor. Two fighting types and three steel types? Airika, there is only one fighting type. Its evolution may be delayed but its pretty good when fighting Burgh, Clay and Marlon with it's interesting moveset. If your Chandelure doesn't a loss of Sp. Atk, use Flame Charge or Fire Blast instead. Need Cut early in the game? Purrloin is a perfect slave. This team DOES NOT contain starter!!! Haxorus is this team attacker. It has mostly Dragon-type attacks because they are powerful. But X-scissor is on the moveset because it's powerful and it can deal pretty good amount of damage to Dark-type Pokemon. Dragon Fang boosts power of Dragon-type attacks. Aggron is pretty useful for E4. If your other Pokemon faint you can revive it without getting this Pokemon faint. If you have ability Heavy Metal replace Autotomize with Heavy Slam. If you give Quick Claw this may move faster than other Pokemon. Iron Head is powerful move. Protect is pretty useful move for making the battle more longer. Autotomize helps dealing Pokemon with good defense if combined with Iron Head or -Tail. Alttaria is pretty good Pokemon because it learns lot of moves that are pretty useful. Like Ice Beam. I didn't put Draco Meteor for this moveset because it has negative effects. And I don't like that move. This pretty balanced Pokemon. Lilligant is pretty nice Pokemon. It has good Sp.Atk, Speed and HP. Defense is high too. Dream Eater is on the moveset, because it's good when combined with Parasects Spore. Petal Dance doesn't confuse you if you have Own Tempo, so it's killer combo. Parasect is only available with trading or in Dream World if you want it before E4. Parasects Spore + Lilligants Dream Eater. Perfect! This team has two Grass-type Pokemon. Pretty good team after all. I recommend this team if you have Dream World available. Two Dragon types, two Grass types, and No Fire types? A nice moveset for a Pokemon with good attack and special attack power, STAB towards the already powerful surf, and good coverage. The Life Orb can be used for taking out enemies quickly. Chandelure is a absolute MONSTER when it comes to special attack. A whopping 145 Special attack base stats total! Well rounded moves that have good coverage against some very strong types like Fighting, Ground, and Water. While Psychic is uneccesary and Thunderbolt can be useful, the REAL reason Mr. Mime is here is because if you use Calm Mind in conjuction with Baton Pass and switch in to Chandelure, who already has insane Special attack power, Pokemon will be a whole lot easier for you. Feel free the change Psychic into any move you wish, But it just depends on your timing when using that combo. Filter can really help with that matter, as it wil help you survive some super effective moves. Half Special, Half Physical. The goal is usually to make the most well-rounded moveset possible. I covers against Dark, Rock, Ground, Steel, Ice, Psychic, Ghost, Dragon, and Poison. It complements the Expert Belt nicely, an item the boosts super effective hits by 20%. 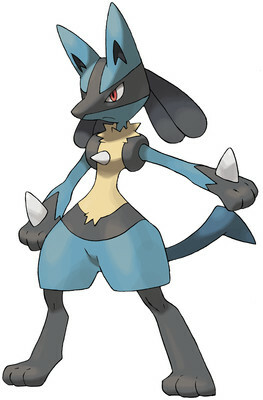 Lucario has good enough attack and special attack power to sweep against 3 of the Elite Four's Pokemon. Inner Focus will not come into play if you flinch with Focus punch though, So don't get to cocky and replace Aura Sphere with it. Due to Sheer Force, the Life Orb will not give you recoil damage. That's a 30% Boost in all your moves for free! Bulk Up takes care of the detrimental effects from Superpower, which, in my opinion, make Superpower even more reliable than Close Combat. Brave Bird is powerful 120 power move that gets a 30% boost, plus STAB, to sweep Bug and Grass-Types. Sheer Force will also make Rock slide more powerful, at the cost of removing its flinching effect, plus the 30% boost, A secondary coverage against the dreaded Ice-Types, like Black Kyurem, who has the second highest Attack stats EVER, and his signature 140 power move, Freeze Shock. All a basic set for a strong pseudo-legendary. Dragon pulse for Dragons, Flamethrower for Grass and Bug, Crunch for Psychic and Ghost, And U-Turn for Dark. What is a good in-game team for Black/White 1?